Business-to-Business web sites have needs that are different from Business-to-Consumer sites beyond the obvious. For example, while there are inexpensive generic Business-to-Consumer eCommerce alternatives such as Yahoo and eBay, most Business-to-Business transaction sites are expensive and custom-built to suit their specific category’s needs. But while generic shopping carts may be adequate for selling generic merchandise they do not provide a platform for presenting Fashion lines (capital F). They too require customization. We’re all partners in the business of delivering fashion to the consumer. 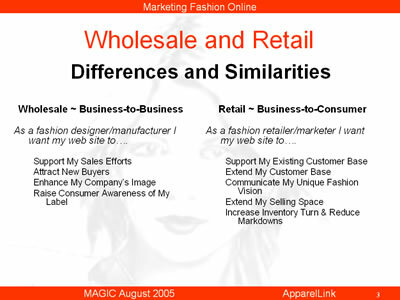 Whether wholesale or retail we are all part of the fashion merchandising and marketing chain. Throughout this presentation you will find functions that focus mainly on the retailer will often apply to the manufacturer.